EAST VILLAGE — Dozens of students, alumni, and supporters of design school Cooper Union's free degree programs marched from Washington Square Park to the college's Astor Place campus to protest the school's plans to adopt a tuition-based model. "I wouldn't be able to go Cooper Union without free tuition, and I think that the majority of the students wouldn't be able to study there either without the free tuition model," said Saar Shemesh, 21, a current student studying art, sculpture and photography at the school. She arrived early at Washington Square Park Saturday to gather and prepare for a march protesting the school's recent move to accept tuition for students. Alumni Willis Bigelow, 23, who is from San Francisco, was concerned about the precident a tuition model would set. "Something should be done about this," said the one-time sculpture and photography student, who now makes handbags. "Even without the free tuition I still would have gone to college, but a lot of students struggle to get an education, so for them this is important." The school, which offers art, architecture and engineering degrees for both graduate and undergraduate students, was founded by Peter Cooper in 1859 with the mission of a free education. "Peter Cooper must be rolling in his grave," Shemesh added. Before 1902, when a large endowment was received, students who could paid for their tuition, Cooper Union's press office has said. After the endowment, all students were admitted with a full scolarship. The newest president of the school, Jamshed Bharucha, said charging students must become an option in the face of economic downturn. 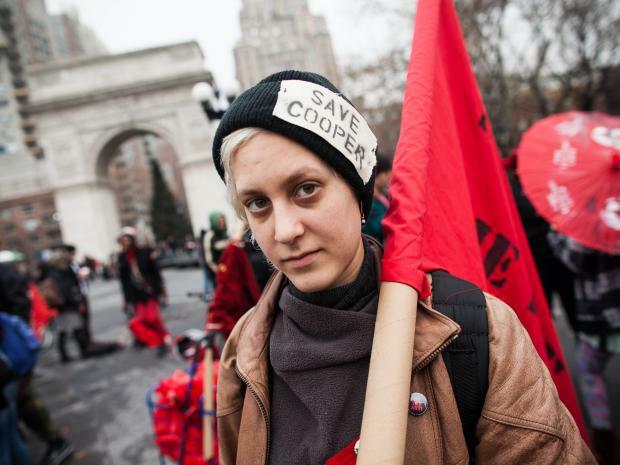 Saturday's march, which began at 3 p.m., was led by organizers from Students for a Free Cooper Union, who have also spearheaded a "live-in" protest inside the school's clock tower. On Wednesday, students reportedly stormed a trustee meeting and interrupted it by weeping in front of members, an action that was live-streamed to those in the clock tower. The march on Saturday was also visible thanks to someone's iPhone video, to those in the clock tower, said Victoria Sobel, one of the 11 barricaded up there. "We're doing very very well. We've been reorganizing our internal communications structure today so we can get messages out to our allies," said Sobel. "It looks like there's over a hundred students on the way to the school. It's awesome to see," she said. The tower group was not just isolated, she explained, saying that their discussions and planning went on with faculty inside, and organizers outside of the school to try and make headway with the school's leaders. They'd also received letters of support Saturday from students all over the world, including the Netherlands and Mexico. Sobel, a Fine Arts major, said her family was also backing up her efforts. "They have given me all their support. Obviously they are concerned about my safety, especially if there is police intervention." The barricaded protestors will be able to stay put for at least for a few more weeks, she said.